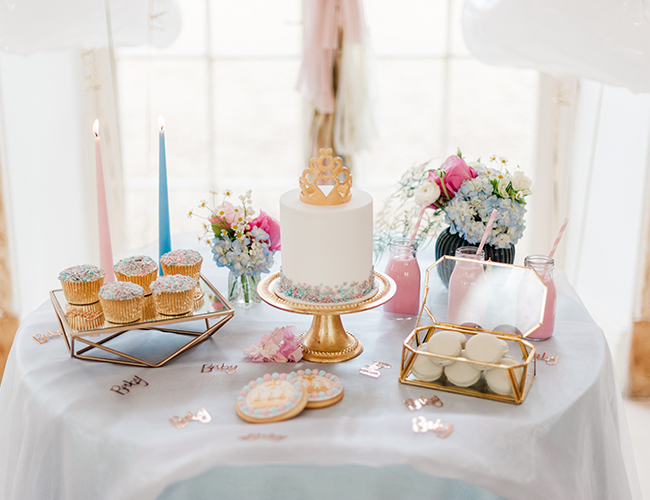 This elegant, pink, blue, and gold royal baby shower is truly fit for a prince or princess! 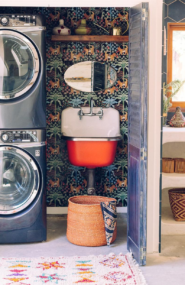 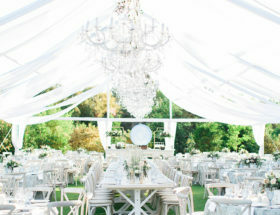 And that’s exactly what Couture Events had in mind when they dreamt of the beautiful spring shoot; it should be regal, beautiful, signify the season, and celebrate new beginnings. 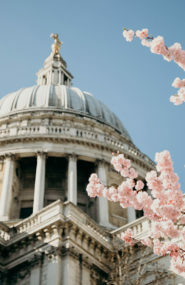 As we anticipate the royal family’s new addition later this month, we wish we could take part in all the festivities leading up to the royal baby’s arrival! 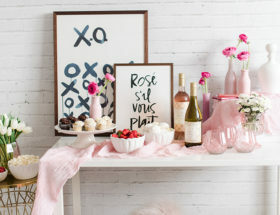 But, alas, some things are privy to parties involved, however, that won’t keep us from celebrating on our own! 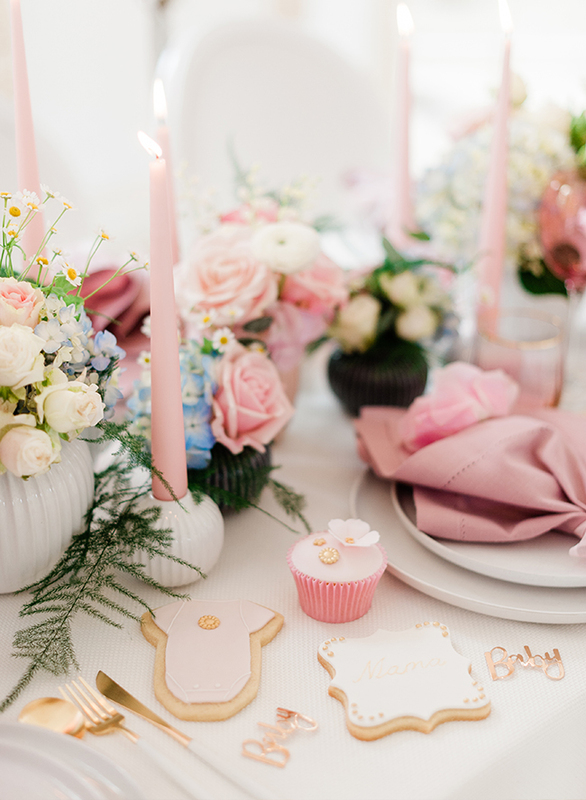 This baby shower inspiration is everything we would hope the real royal baby shower was and more… see for yourself! 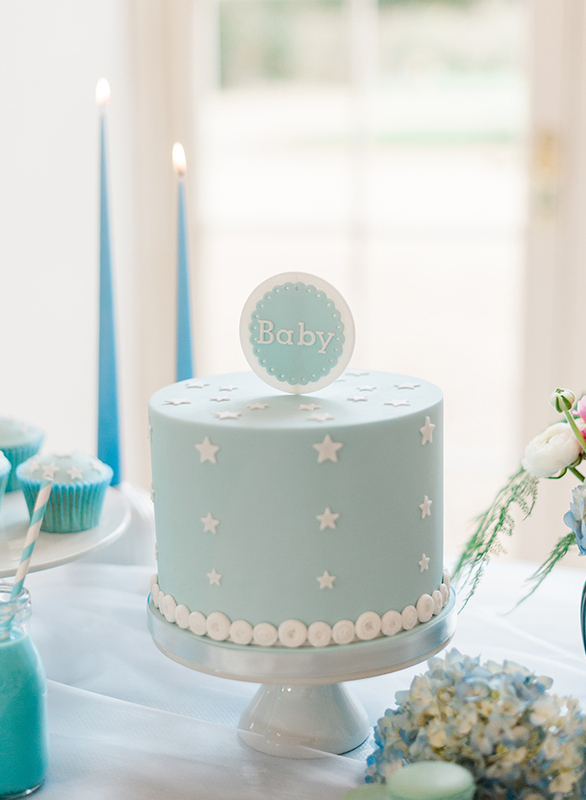 As a working mother of 3 children, family is at the heart of everything I do and there can be no greater celebration than the arrival of a beloved baby into the family. 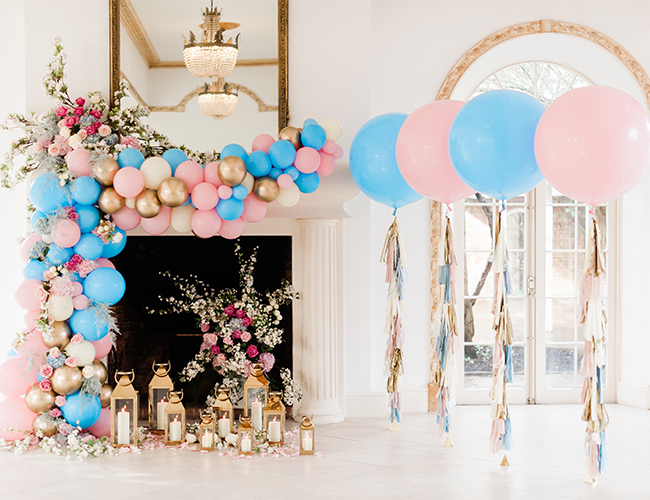 My inspiration for this Royal Baby Shower styled shoot came from the fact that along with millions of others around the world, I share the excitement of the Duke and Duchess of Sussex, Prince Harry and Meghan Markle, as they count down the days to meeting their darling baby for the first time. 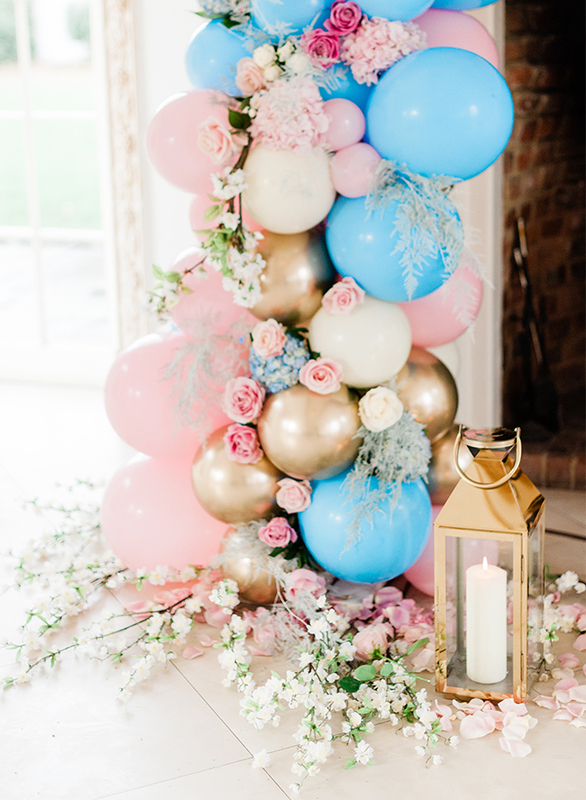 As a wedding and events planner, I am also constantly inspired by the seasons, and as Spring approaches, with all its promise of new beginnings, I wanted to create a styled shoot which wove together the joyfulness of a baby shower and the onset of Spring, with the inspiration of a new Royal baby at its heart. 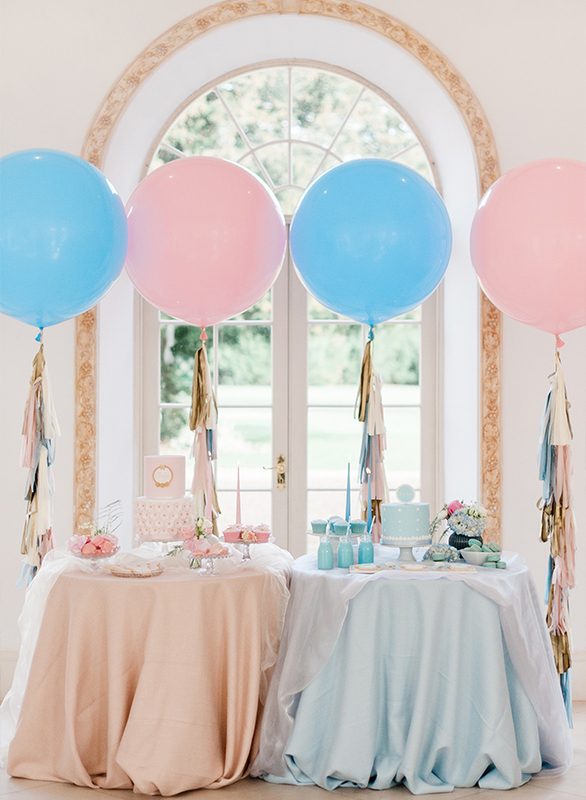 I therefore conceived this royal baby shower inspiration using pastel pinks and blues and specifically chose an elegant and sophisticated location, full of natural light. 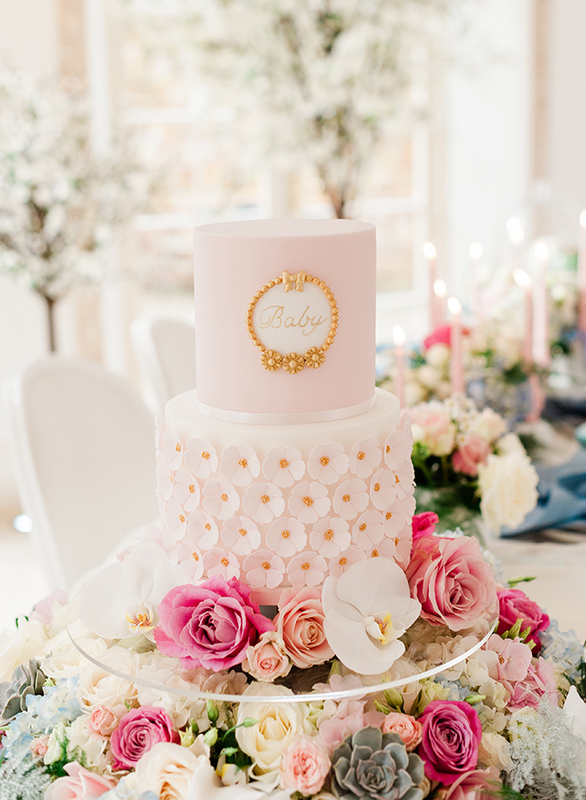 I also wanted to subtly incorporate daisies (which are symbolic of innocence and purity as well as new beginnings – the perfect floral metaphor for a spring baby shoot) and elegant crowns, to reflect that this shoot was designed in honour of a royal Prince or Princess. 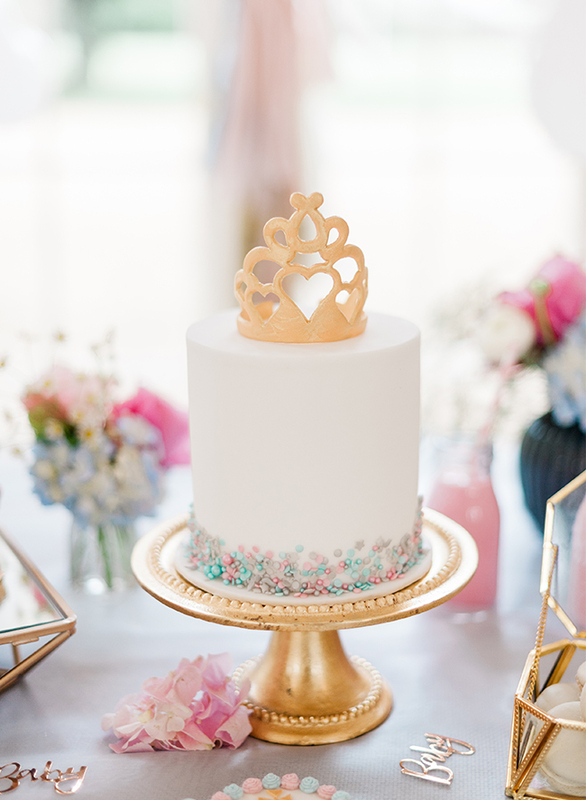 You will notice then that daisies and crowns feature both in the floral designs on the table and also on the cake designs but in an understated way. 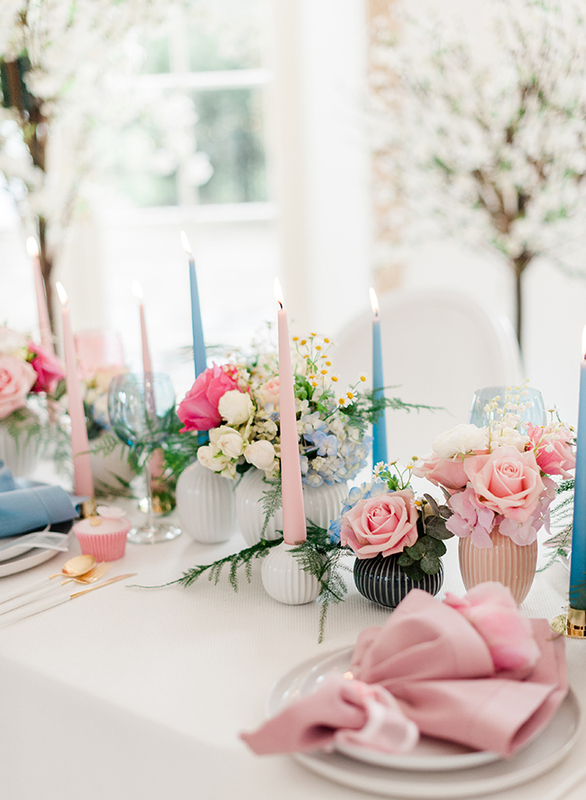 I shot the tablescape and the dessert stations in both mixed pinks and blues and also entirely in pink and entirely in blue, so that the most appropriate set of coloured images could be used on the day of the Royal birth is announced to the world. 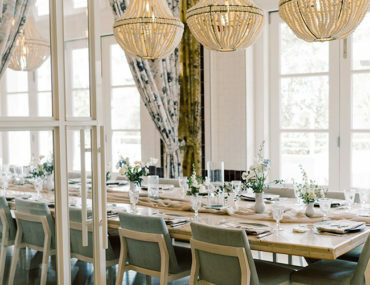 The venue, Northbrook Park in Surrey, was the perfect backdrop for this shoot – offering the prestige and history of a great British stately home while also being quietly luxurious and understated – a reflection of Harry and Meghan’s lack of ostentation. 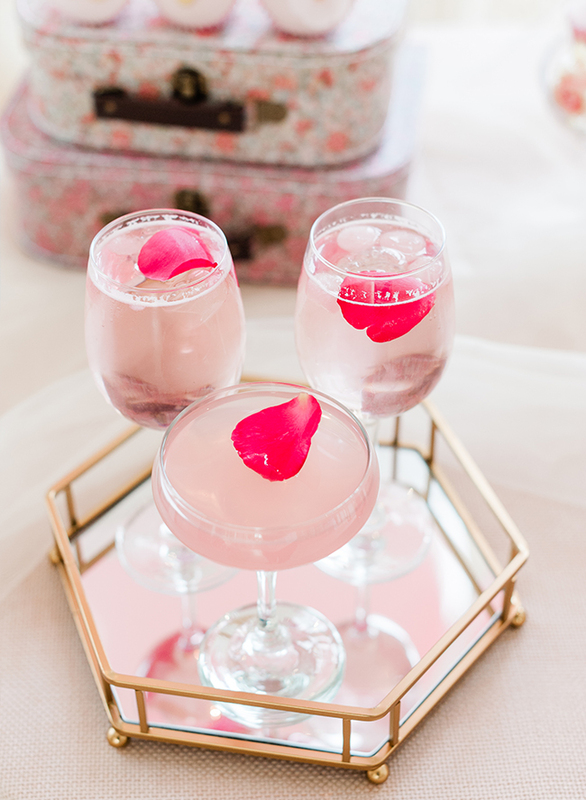 I created 3 distinct areas for the baby shower – a bespoke installation, a beautifully curated tablescape and a dessert table, complimented by bespoke cocktails and two unique themed floral centrepieces. 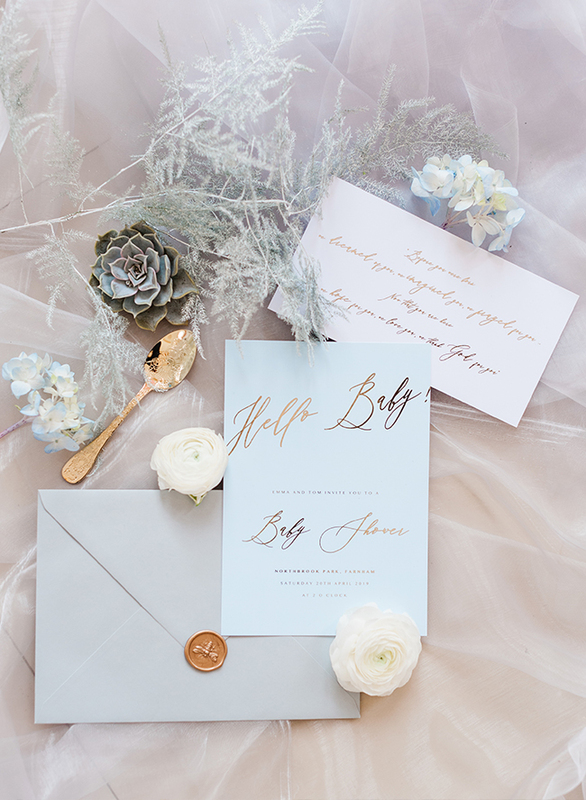 I chose to reflect the venue’s delicate vine leaf gold engraving in the stationery and as I wanted a classic look with a modern edge, chose to work with KnockKnock Penny Studio (who is also a working mother juggling her creative work with a young toddler). 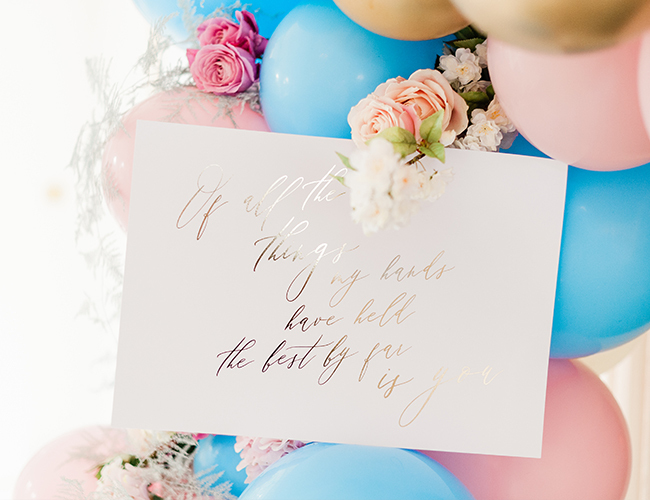 We used an elegant yet contemporary script font on the stock for both the invitations, the miniature tags and the signage. 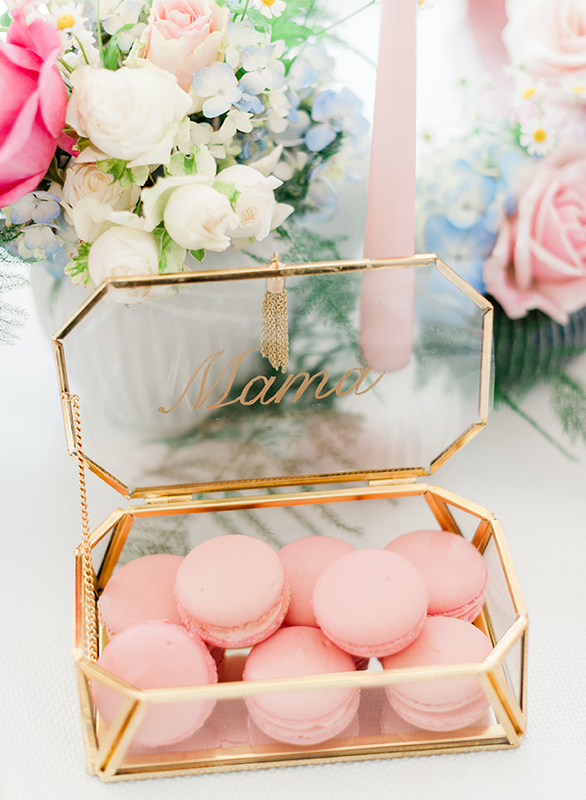 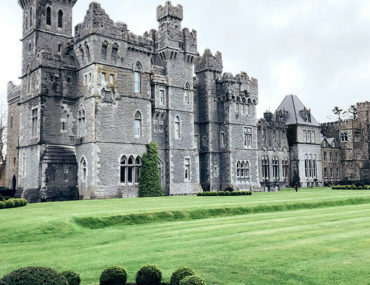 This gold detailing would then be further picked up in some of the other elements such as miniature balloons and the elegant, contemporary cutlery. 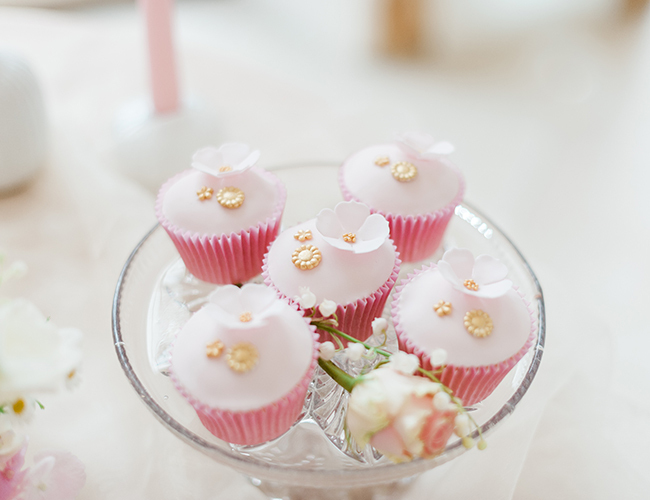 Miniature Champagne bottles and bespoke cocktails, mixed by the experts at Coxtails Events, welcomed guests on arrival, served from a table styled with traditional nursery toys such as beautiful teddy bears hand made in England using iconic Liberty London fabric and vintage style nesting suitcases. 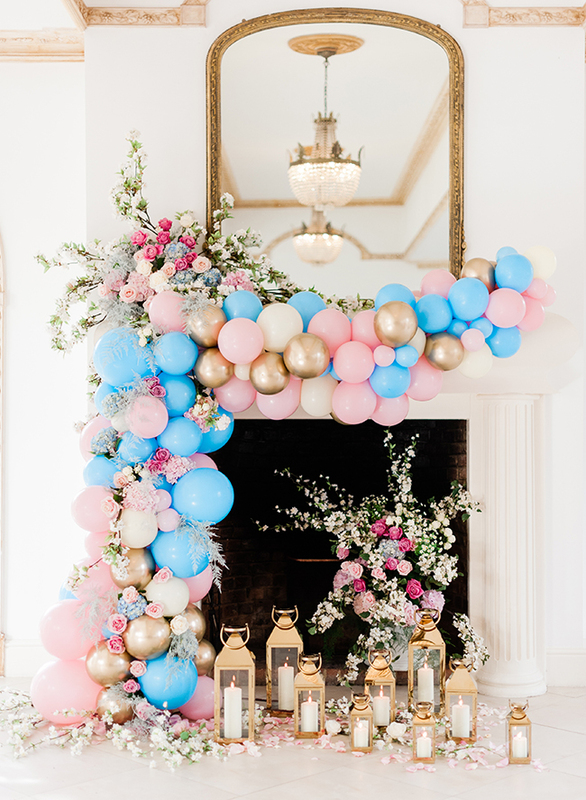 Inspired by the incredible 7’ high fireplace, I worked with the Creative Director at Blomster Designs Flowers, Russell New, and the team at Bubblegum Balloons to design a bespoke installation combining beautiful spring buds and blossoms bursting out of the fireplace and merging with the huge asymmetrical balloon arch, with petals and lanterns free-flowing around the base. 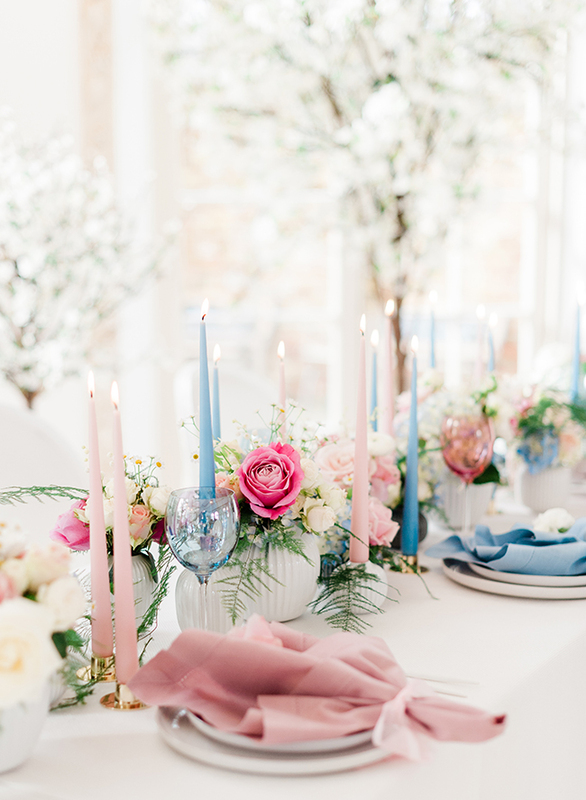 My table scape design was classically elegant and understated, featuring a run of beautiful, naturally flowing floral arrangements in clusters of modern ribbed vases, complimented by striking taper candles. 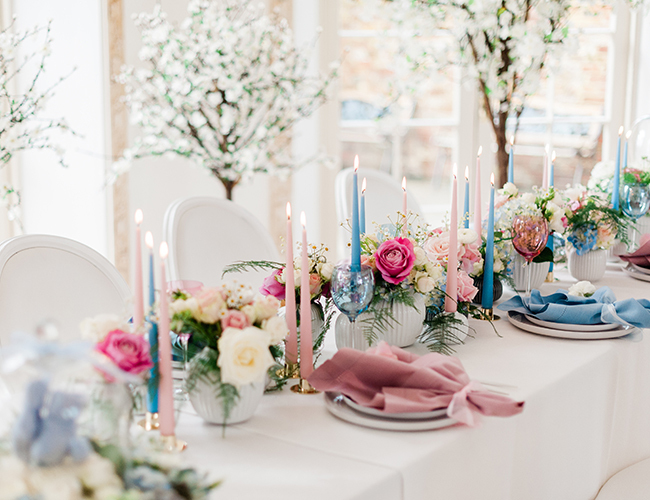 I kept the place settings simple with contemporary white china and minimalistic cutlery, allowing the stunning crisp, colored glassware to really pop. 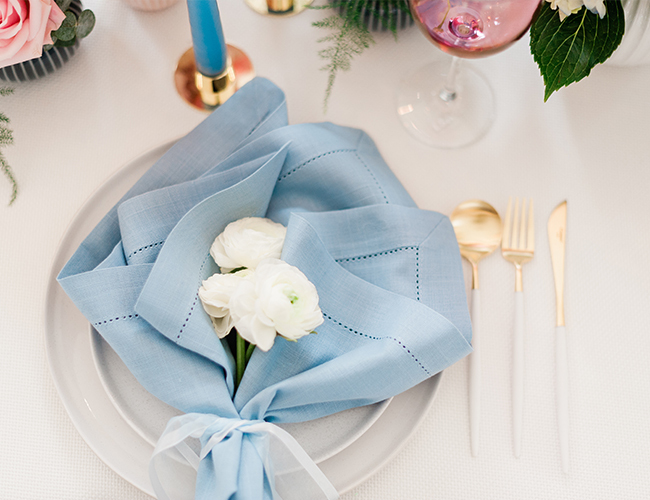 I kept the napkins loose and unstructured, tied simply in silk ribbons with a flower as décor. 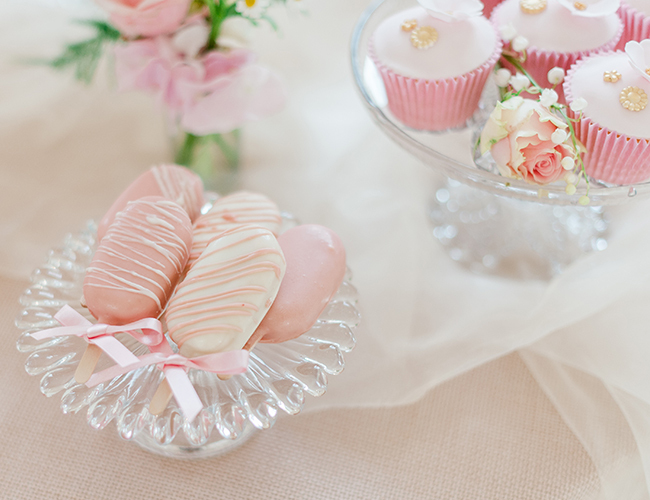 Each guest also had a cupcake treat at their place setting and a personalized iced biscuit. 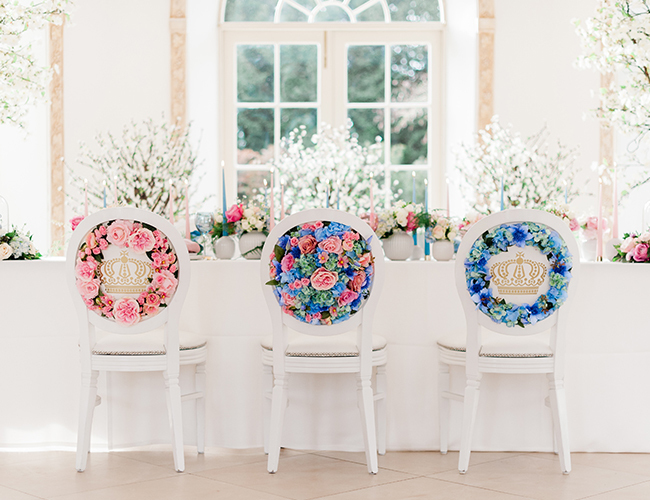 For the chairs, I chose crisp white leather Chandelle chairs, and worked with the team at Couture Chairs, in collaboration with Great Hire, to create some custom made chairs, featuring a bespoke Royal monogram design and stunning floral backs, perfectly matching the flowers in the table scape and introducing a crown icon into the shoot. 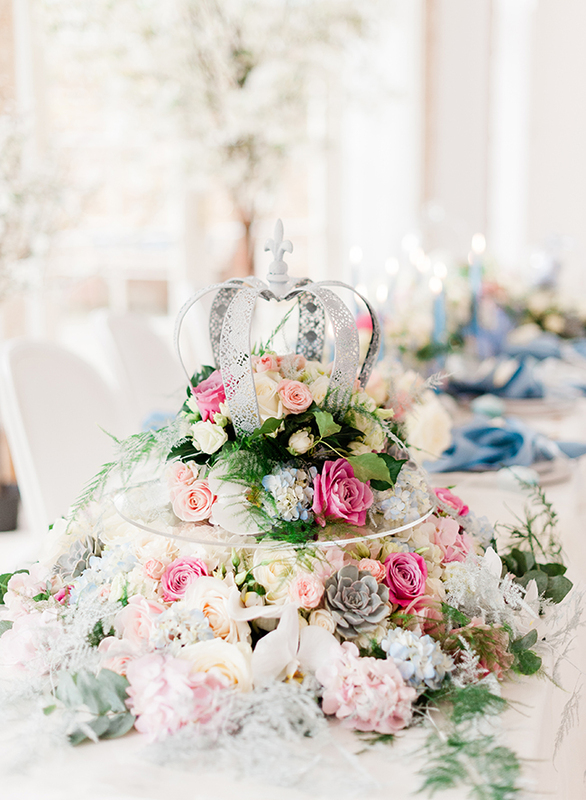 A stunning white iron crown filled with flowers, atop a floral Perspex tray, continued the Royal theme. 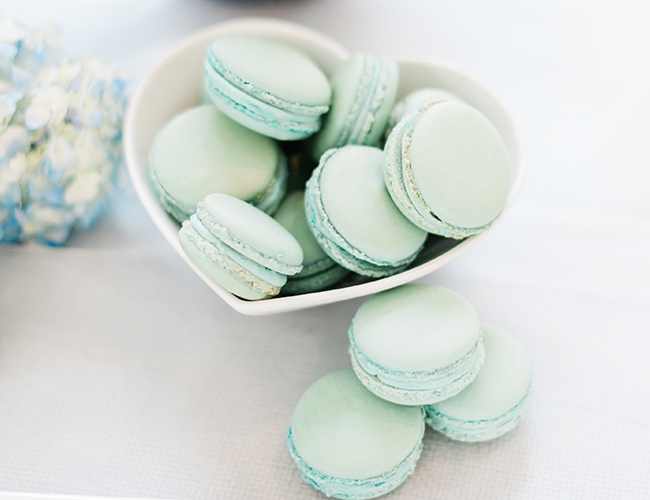 Guests were treated to a mouthwatering array of sweet treats including macaroons, cupcakes, iced biscuits and feature cakes, crafted by luxury cake maker and patissier, Lindsay Pemberton, in her unique signature style. 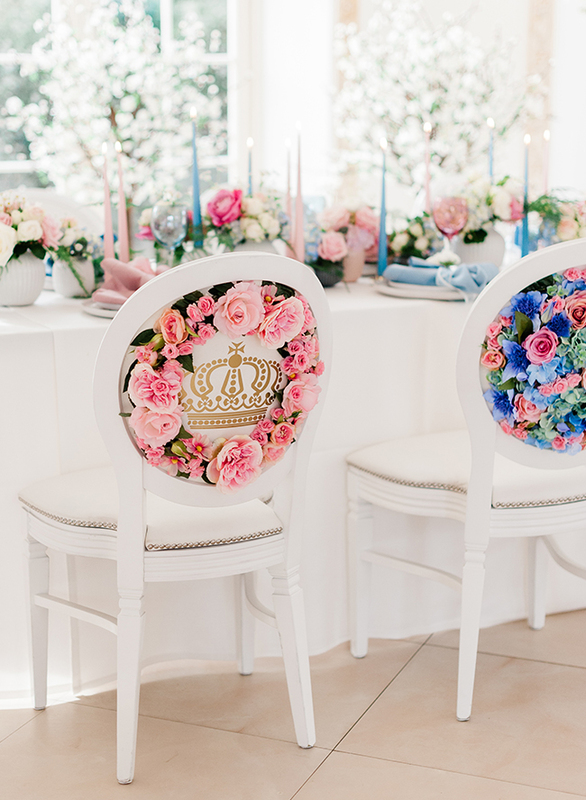 Her designs not only included perfect replicas of baby gros but also mirrored the crown monogram from the bespoke chairs in her stunning detailed icing. 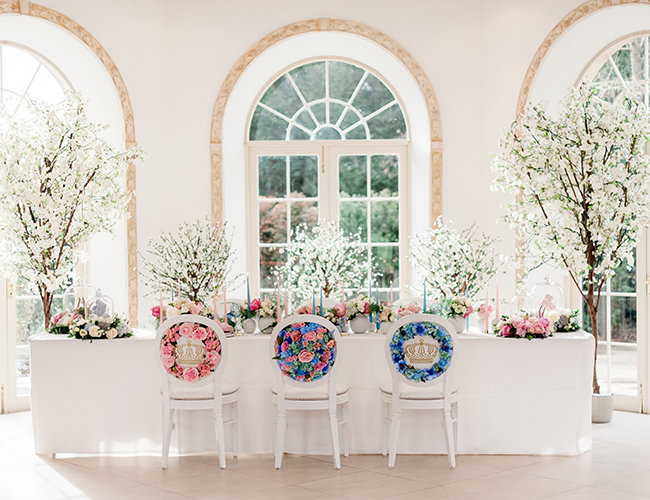 Three elements have lodged in my memory as the highlights of the shoot – the cashmere booties inside the protective floral cloches worked so well and I was delighted with the bespoke chairs which complemented the tablescape so perfectly; in addition Lindsay’s incredibly delicate icing on the biscuits really took my breath away. 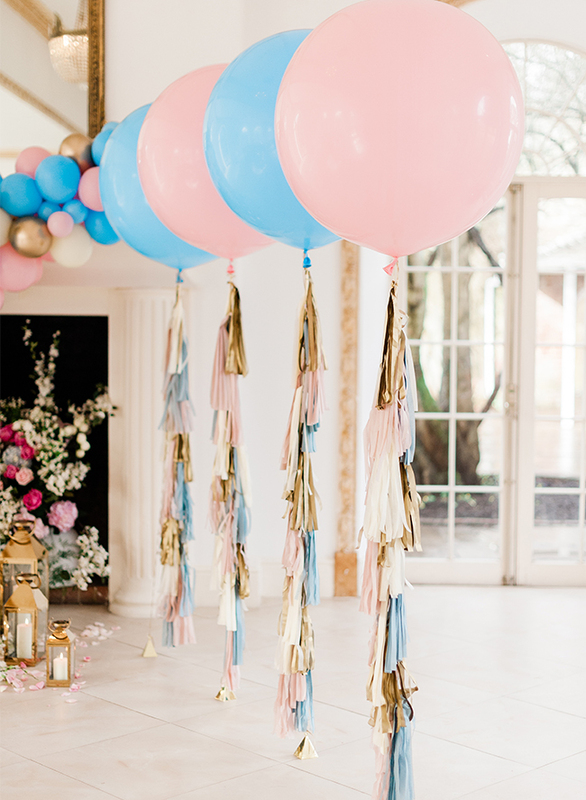 I absolutely loved creating this styled shoot which I hope you’ll agree is both fit for a Royal baby while remaining attainable and achievable, which I hope will be an inspiration to all parents to be.